Something seems to have happened to the oceans at the end of Cambrian Epoch 2. One indicator is that the magnesium content of seawater seems to have dropped. We know this because, in the Early Cambrian, calcium carbonate precipitated out of seawater as aragonite, a the preferred crystal form of calcium carbonate when relatively high concentrations of magnesium are present. When magnesium concentrations in seawater are lower, calcium precipitates as calcite. For reasons we don't need to get into, both high water and low magnesium are correlated with a higher rate of sea floor spreading -- the creation of new sea bottom from magma which seeps out along mid-ocean fault zones. 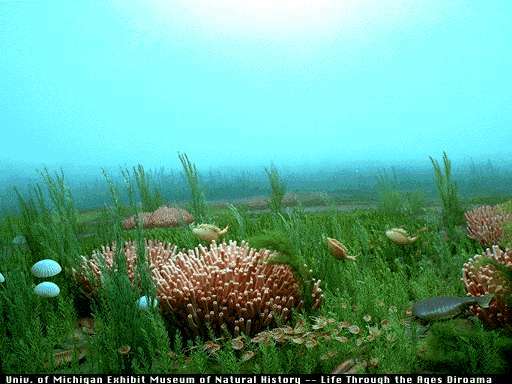 The Early Cambrian marked a dramatic increase in the rate of sea floor spreading. So, as we have mentioned, the seas rose and magnesium concentrations dropped. At just about 501 Mya, a crucial threshhold was passed, and the Earth entered a long period of calcite seas. This was to last throughout the remainder of the Early and Middle Paleozoic. At just about this same time, sea levels dropped slightly -- not a great deal, but quite quickly. The combination of physical and chemical changes may have been the cause of the significant faunal turnover we see at that time. The archaeocyaths died out rapidly, quite likely as a result of these changes, and were not replaced by other reef-forming organisms for many millions of years. This caused a further massive physical change in the shallow water environment. By this time, the metazoan revolution was in full swing. 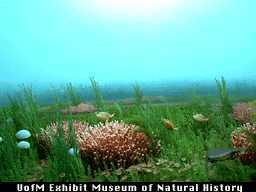 The habitat destruction of the Middle Cambrian may only have selected for even bigger and more mobile forms able to take advantage of the open sea bottom. This was the time of the anomalocarids, Earth's first really large carnivores, some of whom reached lengths of 2 meters. Andrew Parker has recently emphasized that this was also a time when several key groups evolved eyes. As Parker notes, this has some important correllates. Vision takes much more brainpower than most other senses. Reacting to what one sees also requires quicker and more flexible responses. Further, when hunter and hunted can see each other, both will discover that a higher premium has been placed on mobility.